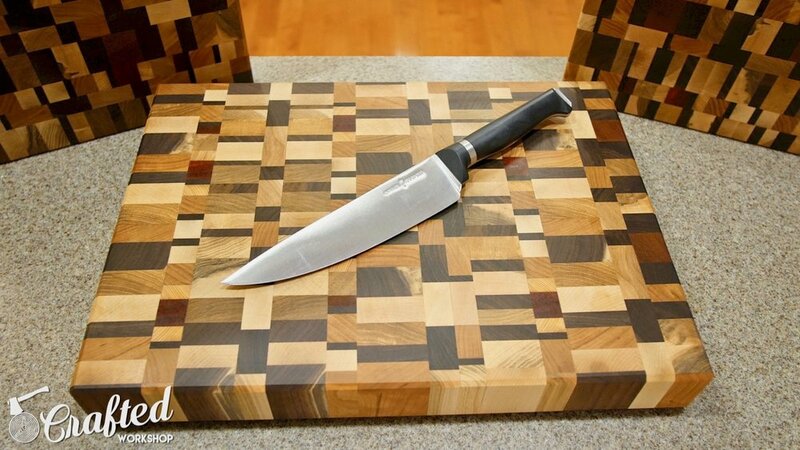 In this woodworking project video, I'll show you how to build end grain cutting boards from scrap wood! These chaotic-style cutting boards are the perfect gift and are a great way to use up those scraps of hardwood you have lying around the shop. Or, you could do like I did and purchase a pile of scraps just for this purpose! Let's get started! 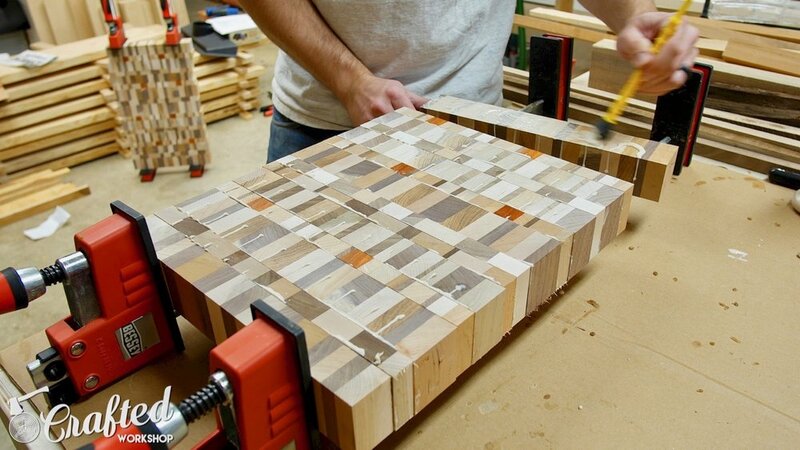 It seems to be a rite of passage for woodworkers to make cutting boards. Somehow, I had skipped over this project during my woodworking adventures so far, and since the holidays are here, it seems like the perfect time to rectify that oversight. I bought this pile of scrap hardwood off of Craigslist for $40 to use on this project. 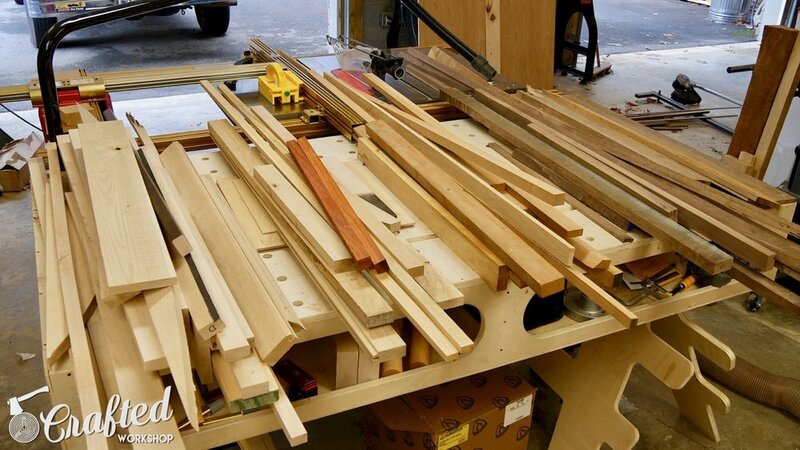 Once I got it home, I sorted through the pile and organized the wood by type, and also threw out any pieces that were too small to use. The pile included cherry, walnut, maple, hickory, and oak, and I also added a few scraps of Padauk that I had from a previous project. I set aside the oak for another project, since it’s not a great choice for cutting boards due to its open grain structure, and then started breaking down the pieces into blanks. The nice thing about making end grain cutting boards is the thickness of the piece doesn’t really matter, since it’s all going to be glued up, sliced up, and then turned on end. This means that I had some blanks that were ½” thick and some that were 2” thick. This makes it a really effective project for using up all of those odd sizes scraps that you’ve been hanging on to. I continued processing my scraps into blanks until I had seven unique blanks. Once I had my pieces arranged the way I wanted them, I passed them through the planer, planing each side of the pieces. This gives the pieces two flat surfaces for the glue up, which will help in eliminating gaps in the final cutting boards. Once the pieces were flat on two sides, I glued them together using Titebond III, which is a food safe, waterproof wood glue. Titebond II isn’t technically waterproof, just water resistant, so it’s probably best to use III for this build. After the glue dried overnight, I began flattening the blanks. Since the bottoms of the blanks were relatively flat from the glue up, I just passed them through the planer, flattening one side, then flipped them over and flattened the other. My jointer is not wide enough to flatten these boards, since they’re 13” wide. I basically built these cutting boards to the maximum size my planer could accommodate. Once the blanks were flat on both sides, I took them to the table saw, cleaned up one end, and then starting cutting slices. I wanted my cutting board’s final thickness to be 2 inches, so I cut 2 ⅛” strips from the blanks to allow some room for surfacing after gluing. After making each cut, I turned the slice 90 degrees to show the end grain and set it aside. Once I had all of my blanks cut, I started arranging them into their final orientation. I made sure to put any knot holes or other imperfections facing down when possible. These boards will have rubber feet added, so the top will be the only side used as an actual cutting board. With the strips arranged how I wanted them, I glued them up using the same process as before. I made sure to keep them as flat as possible, since any slipping at this point will just mean wasted width, length or thickness on the final cutting boards. After the glue dried, it was time to flatten the boards one last time, and for this, I decided to use my planer. Now, this is a bit of a debated topic in the woodworking community. 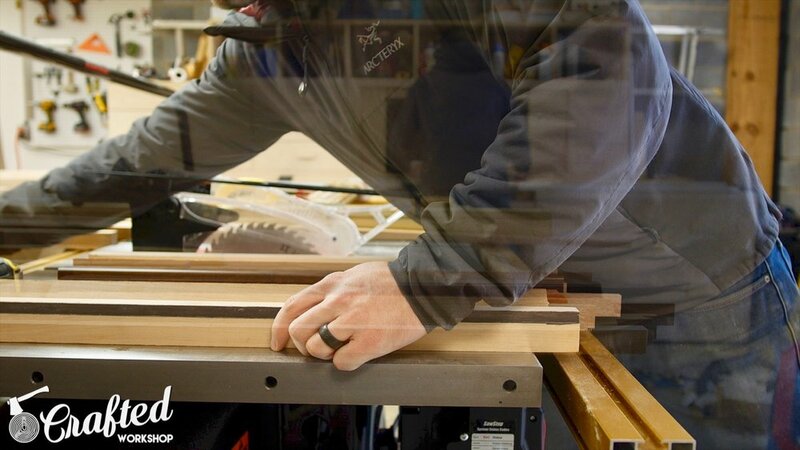 Some folks say that passing an end grain cutting board through a planer is a bad idea, since the pieces can break apart or the whole board can be thrown back at you. This is my disclaimer, do whatever you feel comfortable with here, I am not responsible for your choices in the shop! What I did, and what worked for me, was the following: First, I rotated my blades right before flattening these boards. It was time for fresh blades anyway, and having super sharp blades certainly helped here. Second, I took extremely light passes. On this Dewalt planer, I turned the handle a quarter turn between passes, and this took less than 1/32” off the boards on each pass. Last, I chamfered the back top edge of the board before starting the flattening. This really helped to prevent any chipping at the edges during the flattening process. You could also add a sacrificial board to help with chipping. I just took my time, and the boards turned out close to finish ready right off of the planer. Again, do this at your own risk, but this worked out great for me. After the boards were flattened, I cleaned up one edge on the jointer and then cleaned up the other three edges at the table saw. As you can see, you’ll be left with a really great looking cutting board at that point. Next, it was time for sanding. Lots and lots of sanding. I started at 80 grit, going over every surface of the boards until any remaining tool marks were removed. 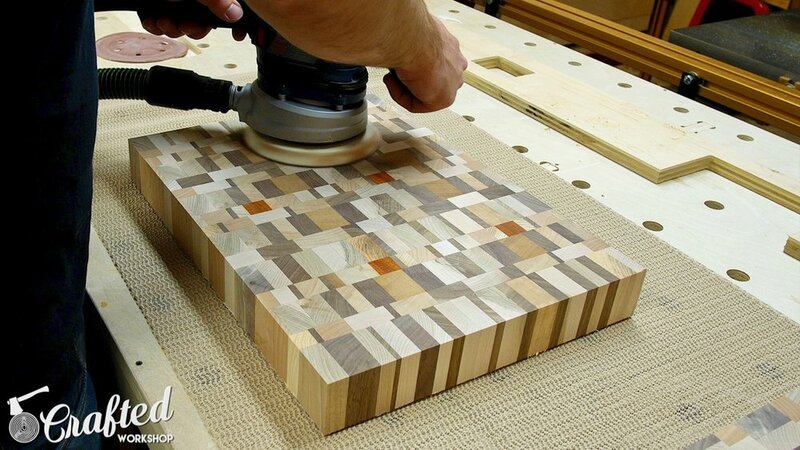 Since these are end grain, the sanding process will take longer. One nice thing is any scratches will show up as white marks on the end grain faces of the boards, making it easy to identify any problem areas. After 80 grit, I moved onto 120 grit, sanding all of the faces. After sanding with 120, it would be a good time to fill any gaps or cracks you have. You have a few options, either wood glue and sawdust or epoxy. Again, since only the top of these boards will see use, I only filled any gaps in the tops. Once that was done, I chamfered all of the edges of the boards with a block plane. I originally tried to use a router with a chamfer bit but was getting a lot of chip out, and the block plane worked great for this. Finally, I finished the sanding process with 180 grit, sanding the chamfers as well on this step. With sanding done, it was time for finishing. 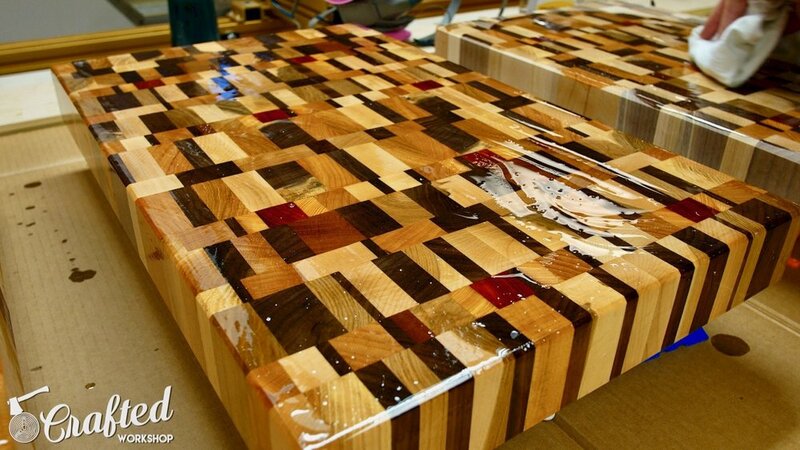 Finishing cutting boards is another hotly debated topic in the woodworking community, but I decided to go with the classic mineral oil finish. Make sure to get food safe mineral oil, I’ll have a link to the exact oil I purchased in the video description and build article. This finish basically soaks all the way through the wood, since the end grain orientation of the wood allows the finish to travel through the cutting board. This is great for helping to repel water when the board is being used later. Apply plenty of finish and allow it to soak into the wood for an hour or so, then come back and wipe off the excess. Wait 24 hours, do the same thing again, and the board will be ready to use. There are plenty of other finish options here as well, and a lot of people add some type of wax, usually beeswax or paraffin wax, to their mineral oil for the final coat. Do some research and pick your favorite. With the finish applied, all that’s left is to add some rubber feet and get to cutting! If treated properly, these cutting boards should last a lifetime, literally. If the surface gets really damaged, you can just take it back to the shop, sand it down, reapply finish, and get back to cutting! That is one major advantage of having the thickness to your boards; you can sand them over and over without them getting too thin.